Cough and cold usually occur when there is a change in season. Coughing is body’s natural way to expel the unwanted particles from the air passage. Toddlers or young children are at higher risk of getting this cough as they are very sensitive to changing environmental conditions. Toddlers cough can be caused by many reasons, such as: allergies, weather changes, pneumonia, respiratory syncytial virus, croup, asthma, post nasal drip, common cold, GERD, environmental irritants, etc. Its symptoms include frequent coughing, breathing problems, sore throat, chest congestion, vomiting, watery eyes, sneezing, hoarse voice, runny nose, headache etc. Try these natural remedies at home to get relief from the cough and cold, rather than sugary alternatives. Listed below are some natural, safe, effective home remedies to cure your child’s cough. Lemons contain vitamin C that helps to boost your immune system by increasing the white blood cells count to fight against the virus and the infection that causes cough. Fill a clean feeding bottle with 8 ounces of warm water. Add a teaspoon each of freshly squeezed lemon juice and natural sweetener. Stir well and then feed to your baby when it is still warm. Repeat it regularly as needed. This process helps to relieve sore throat and clear the mucus effectively. Ginger stimulates the saliva production that helps to thin the mucus secretions. Crush a small piece of fresh ginger. Add to a cup of boiling water. Allow to steep for few minutes and then strain the tea. Give this to kid 2 – 3 times a day when it is still warm. Buckwheat honey is rich in antioxidants and has microbe-fighting effects that help to get rid of the cold and cough. Take a teaspoon or two of pure buckwheat honey and mix with a glass of warm water or juice. Feed to the toddler regularly. You can also add a dash of white pepper and few drops of lemon juice to boost the effectiveness. Steam can help to loosen the nasal secretion by giving necessary moisture to the air to relieve the mucus. Take a bowl of hot water and get a towel that covers you and your toddler. Explain them how to inhale the steam deeply and slowly. You can also use a hot shower and inhale the steam. Do this for 15 – 20 minutes. Repeat this regularly to get relief from the cough. Eucalyptus essential oil has been extracted from the leaves of Australian eucalyptus tree. It can be used to treat coughs, colds, bronchitis and other respiratory related problems. Mix few drops of eucalyptus oil with any carrier oil like olive oil. Massage on the baby’s chest and back regularly. Note: Avoid instilling eucalytpus oils into the nose of infants and young children. Avoid applying eucalyptus oil on the face of children below 10 years of age..
Honey contains antioxidants and can soothe the throat and gives relief from cold, cough and scratchy throat. It also acts as natural cough suppressant. Take 1/2 teaspoon of honey and give to children 2 – 5 years old, 1 teaspoon for children 6 – 11 years old and 2 teaspoons of honey to those who are older than 12 years. Repeat this daily, especially at night time. Note: Do not give honey to babies younger than one year as it can lead to any risk of infant botulism. Saline drops are very effective in treating the congestion which in turn helps to heal the cold and cough. Add a teaspoon of salt to a cup of lukewarm water. Stir well and pour few drops into your child’s nostrils. Ask them to stay like that for about 60 seconds and then allow them to gently blow the nose. Note: Do not use salts that contain iodine, scent, color or flavor and added preservatives. Drinking warm fluids will help to clear the mucus and the cough. For both wet and dry coughs, drinking water as much as possible will help. Feed water, fruit juices like apple and orange to your baby. Give 1 – 3 teaspoon of clear liquid up to 4 times a day to children to relieve from coughing. You can feed hot and fresh chicken soup to your kid to get complete relief from the cough. Taking rest and drinking fluids help to treat the problem if your child is suffering from symptoms like runny nose, cough and sneezing. Make sure your children stay away from smoke or those smoking as it irritate the airways that are already inflamed. Place humidifier in the room where your child is sleeping. Remember that the humidifier has to be cleaned regularly to avoid further infection. Regularly use clean bulb syringe to remove the mucus in the toddler’s nose. Elevate the head of your baby when they are sleeping as coughing will be less likely in an upright position. If your child unable to sleep or cough lasts beyond 10 days then consult the doctor. 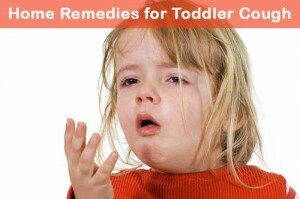 Give only prescribed cough medicines and antibiotics to your toddler. Follow medical instructions. Check your child’s health condition by using a trusted pediatrician and follow their direction and give extract dosage which they prescribe. Following these remedies regularly will cure the problem. Please share your experience with us. Thank you so much for its post! It is so helpful! My daughter gets sick with a cough at leat once a year. There are so many remedies I read about, echinacia, goldenseal, marshmallow root, licorice root elderberry, I don’t know what to chose and they are expensive. I like that all your remedies are simple cheap and things I have a home. Oh and work of course haha. I used better Cola, ginger, garlic, onions, red oil, lime n honey. Blend all together n filter it into d honey bottle. It works like magic. Also silverbirt oil inside very hot water, d vapor help in clearing their airway. Let dem face d vapor.. No need to cover wit toddler face with while during dis, but make sure bath room door n Windows are close. Very effective. My son of 2yrs is always having constants cough n noisey breathing. We got fed up of antibiotics. Hi, great tips! I have a doubt regarding one of the tips though. What is buckwheat honey? Is there any age restrictions like regular honey? My LO loves milk and insists I give her milk even when she has a bout of chest congestion and cough, so I switch to turmeric milk and garlic milk. Buckwheat honey is referred to honey collected by honeybees from buckwheat flowers. I gave 5ml to my 4 year old (did not tell him it had onion) and I have noticed his cough loosen up and become more phlegmy, and he is coughing it up easier as well. He said “mmmm honey” when I gave it to him for anyone worried about the taste. Has anyone used silver solution aka silversol… to help a toddler with tje couch and mucus? Hi my son is 3years old. He is having cough in severe way that he is not able to sleep in the night and he is not able to cough. Please give me some remedy I m fed up using the antibiotics.